I am a software engineer first by heart and later by profession ;). Always believe in present and some time if things didn't work then i start believing in future lol!!!. ROT13 (“rotate by 13 places”, sometimes hyphenated ROT-13) is a simple letter substitution cipher that replaces a letter with the letter 13 letters after it in the alphabet. ROT13 is an example of the Caesar cipher, developed in ancient Rome. (Source Wiki). Here Is the new version I have written to apply ROT 13 for alphabets only, special characters are not touched they will remain as it is. I have tried to implement this Algorithm Using Python. Here it goes..
For fun I just thought about writing an algorithm on using pattern search in any given string using python, Lets assume you have a string with a value of “SSDDFFEERRTTYYSS” and a character array [‘D’,’D’], Now use the values of character array as a pattern and search for the maximum character occurrence of match in the string value. in plain words, we have a ..
Expected output is :3 (as DD pattern appears thrice [XXDDXXXXXDDDXXX). Also assume the Char array can be dynamic, I mean could be of any limit of characters. Well this is just a try.. Please review and comment.. Here is the video link on You Tube. Check this out.. if you really love to code on Java. Really hats off to the Code Bubble team. I found this article with well explanation on how to use EasyMock framework while writing your Junits. Just wanted to share with you all. Rational Application Developer for WebSphere Version 8.0 provides a simpler and streamlined way to develop Java EE 6 software, Web 2.0 rich internet applications, and Service Oriented Architecture (SOA) solutions. This release provides an integrated environment for agile developers to quickly build, test and analyze their work on the latest versions of WebSphere Application Server. Read below link for more details. IBM® WebSphere® Application Server V8 is a major release that offers dramatic run time improvements, plus simpler and easier ways to develop and deploy applications. Just wanted to share the below link which contains other major features and improvements in latest release. IBM WebSphere MQ is a family of network software products launched by IBM in March 1992. It was previously known as MQSeries, a trademark that IBM rebranded in 2002 to join the suite of WebSphere products. WebSphere MQ, which is often referred to simply as “MQ” by users, is IBM’s Message Oriented Middleware offering(JMS). Lets see how we can configure MQ with Jboss as a pert of JMS. To install visit IBM website and download a free copy of trial. Step 5: Create a EJB 3.0 project in JBoss Studio or in Eclipse IDE. Step 7: Now Build the project.Start the server, If all the configuration are correct then you will see binding information of the JNDI name in the server logs, This is the first indication that Link between MQ and JBoss has successfully created. Step 8: Now deploy the application on Jboss. 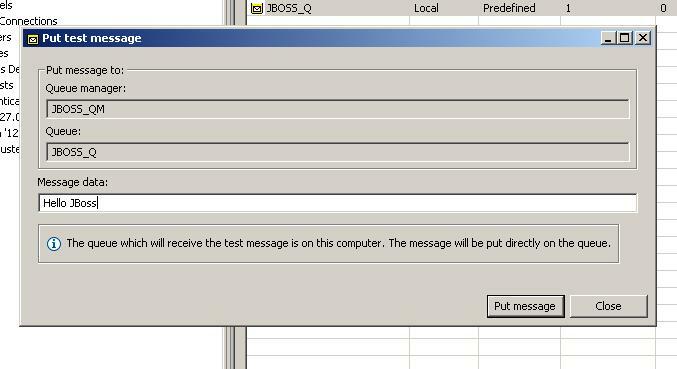 Step 9: Now Open Websphere MQ Explorer and put a message on the Queue. Step 10: Once you put a dummy message on the Queue, See in the server logs to observe the message recived by our Message Driven bean. In this post I will explain the ways we can configure Wired LAN connection on Ubuntu. While configuring any network resource we always need the IP Address to connect to the Domain/Network System. And this IP Address we configure either manually or using DHCP option(DHCP – the Dynamic Host Configuration Protocol – allows network devices to automatically obtain a valid IP address from a server.). There are many networking utilities we can use to configure the network, Now let see Network Interface configuration Using Command-Line. Step 1: Go to Terminal and Type the below command. Step 3: Save the file. Step 4: After you save the file, Its time to restart networking services. Now go to Administration -> System Monitor and click on the Resources Tab and observe the Network History to see the Network connection graph.